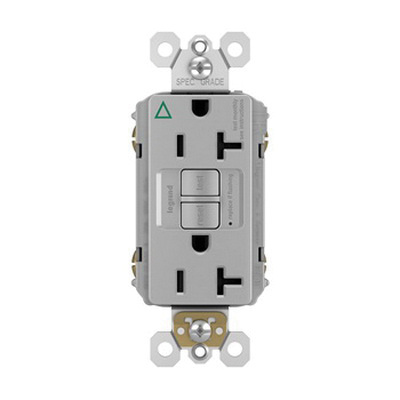 Pass & Seymour Radiant® 2-Pole 3-Wire Tamper-resistant self-test GFCI duplex receptacle in gray color, has voltage rating of 125-Volt AC and current rating of 20-Amps at 60-Hz. It has short-circuit current rating of 10-Kilo-Amps. The specification grade receptacle accommodates #14 - #10-AWG solid/stranded conductor. It features back and side wired terminal connection for easy installation. It has nylon body and face. It features high-impact-resistant thermoplastic construction. It measures 4.2-Inch x 1.73-Inch x 1.03-Inch. The receptacle withstands dielectric strength of 1500-Volts. It has 0.03-Inch brass contact for optimal conductivity and extra-long galvanized steel strap. It withstands temperature range of -35 to 66 deg C.
The isolated receptacle has NEMA 5-20R configuration. It is suitable for use in industrial, healthcare, education, institutional, retail, office, hospitality/lodging, multiple dwelling applications. The receptacle is screw mountable. It has V-2 per UL94 flammability rating to withstand harsh environmental conditions. It features patented shutter system prevents improper insertion of foreign objects. It comes in feed-thru wiring configuration and prevents line-load reversal miswire. Receptacle has LED trip indicator light. It comes with matching TP wallplate. 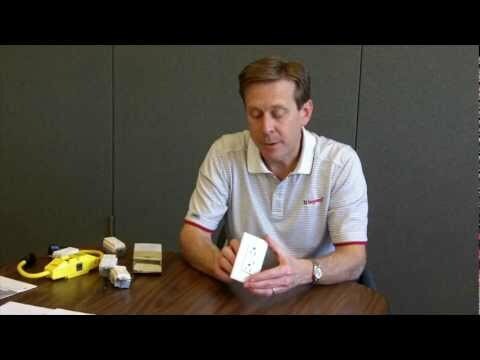 Self-test GFCI duplex receptacle is UL listed and meets NEC standards.